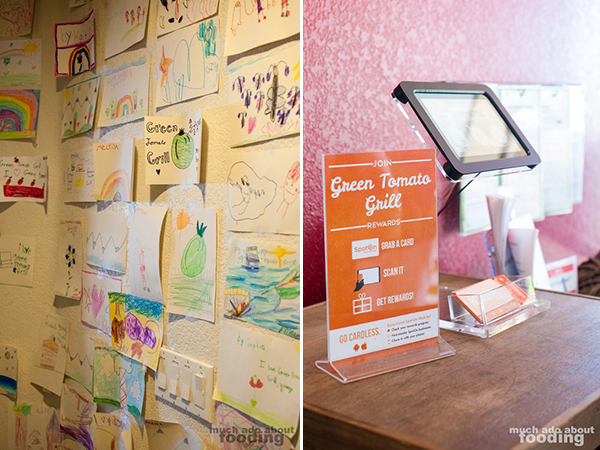 [Update: Giveaway ended 7/14/13] Meet Green Tomato Grill. It sits in Orange, somewhat unassuming of a place from the outside but wait until you see what they've got inside. You'll go flocking to it after learning about their philosophy and concept. We were invited to check GTG (as they also call themselves) out by their Chef Kyle Markt, one of the three owners involved in the creation of this restaurant. Born and raised in Cleveland himself, Chef Kyle has since moved to Orange County and is the chef over at Seven4One in Laguna Beach. Additionally, he leads catering for several events in southern California. 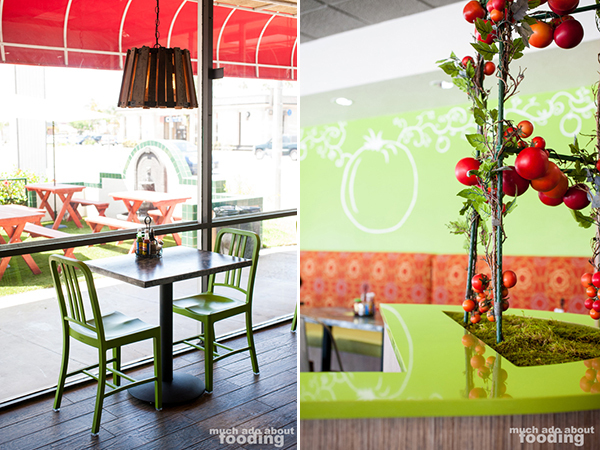 However, since the opening of Green Tomato Grill in January 2013 (they've just passed the six-month mark! ), he's been spending his working and cooking days in Orange, developing the tasty food we shot and ate. The concept is simple: New American Cuisine "that pulls inspiration from all over the world, while sourcing products locally." It's a fast casual joint with all options falling below the $10 price mark (unless you build your own with many add-ons) and under 1,000 calories (except for one that just crosses into 1,004 calories). Like I've said before, it looks like a normal eatery outside but once you step inside, you'll see the clean-cut attention to detail and fresh focus. At the time of our visit, we spotted space for about 32 guests inside and 15-20 outside in the patio but they do have plans to expand their seating arrangements. They also give guests a chance to sign up for Spot On, a loyalty program that rewards repeat customers for each visit, and children are able to doodle all the want to stick up their artwork in the hallway. As for the food, it has been researched and planned out well. Prepped from scratch daily and using local & organic products when able, the meals are designed to be well-balanced in sources from proteins to carbs to vegetables. I'd call the meals healthy but I'm not a nutritionist; I just know that it looked balanced to me and provided plenty for a satisfied stomach. Who's their target audience? Anyone. All walks of life seem to have dropped by and there hasn't been one demographc or the other that has shown more interest. Health seems to be on the minds of all and getting a balanced, nutritious meal is one of the list items. While some may be wary that this place touts vegetarianism and vegan food items because of its gluten-free and dietary accommodating nature, they shouldn't be because there's something for everyone. Currently it has been mainly a lunch spot for customers (and it's easy to be one with its environmental to-go boxes and good price point) but it serves all meal times. Guests get different options when they walk in. They can either build their own via handy-dandy placards that are able to be written on or they can order straight from the menu. The "Choose Your Own" option lists out entree types, size(s), protein choices, sauces, and toppings. The menu lists out a multitude which we'll get to later. While you decide, at least grab a bag of their popcorn. 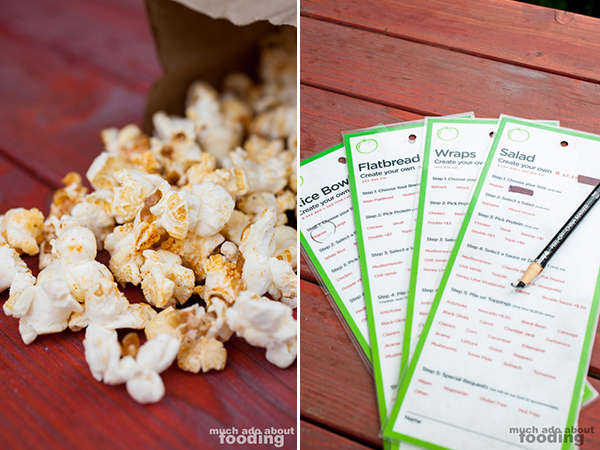 For just $1, you get a bag of kettle corn-sized popcorn tossed in sunflower oil, lemon-lime juice, and adobo seasoning. It was addictive. For drinks, they carry Nordaq FRESH Water in refillable to-go or dine-in options (an impressive filtration system that cleans through water very well), fountain and fresh brewed tea drinks in Greenware cups (we had a China Mist Watermelon Marula tea), fresh brewed coffee, (3) domestic and (3) import beers, Bellini, and wine (mimosas on the weekend!). The signature drink which happened to be out when we were there were their housemade lemonades - darn, next time! Green Tomato Grill's got quite a few sides and snacks to munch on alongside your meal as well. 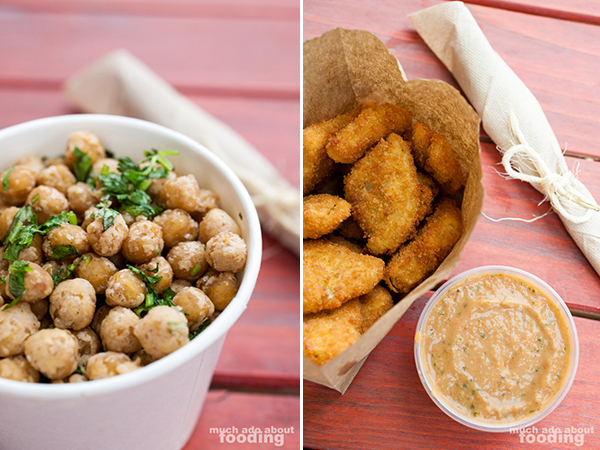 We honed in on their Crispy Chick Peas ($2 - lightly floured and seasoned) and Fried Green Tomatoes ($2 reg, $4 large - panko-crusted and served with dipping sauce). The chickpeas were easy enough to pop, pop, pop into our mouths which we did often as their light seasoning really impressed. The slight flouring contributed to the texture well too. As for the fried green tomatoes, I had asked Chef Kyle if these were the iconic items that led to the restaurant's name but alas, these actually came as an afterthought! Did that make a difference on how fantastic they were? Absolutely not, and I am glad they put it on the menu. Crunchy outside and tangy inside, fried green tomatoes are always delicious but these were given a better touch with the inclusion of panko. 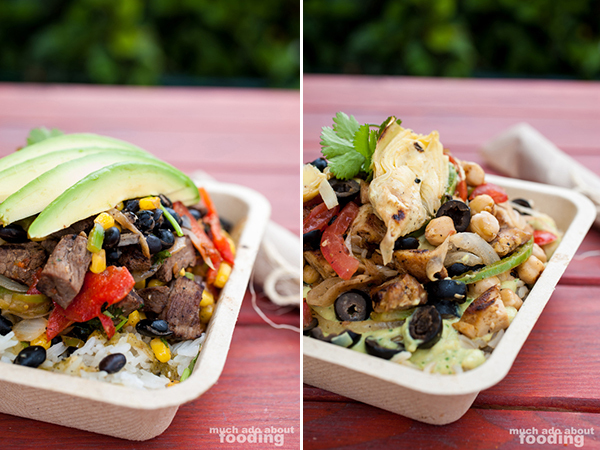 In their Grill Bowls ($6.75 regular, $8.25 large) section, the most popular sold is the Chili Verde Steak Bowl (537/824 calories - marinated grilled steak, chili verde sauce, and cilantro lime rice topped with avocado, black beans, corn, cilantro, onion, and peppers) which we had to try. We also checked out the Mediterranean Chicken Bowl (483/746 calories - marinated grilled chicken, Mediterranean sauce, and brown rice topped with artichokes, black olives, onions, garbanzo beans, peppers, and tomatoes). The menu descriptions hide nothing so we knew all that we were going to get but we didn't expect the beautiful presentation. Meats cooked well and vegetables very fresh, these bowls were hefty and filling while staying balanced. The seasoning was just right (many fast casuals seem to err on the side of too much salt!) and the sauces a welcome new spin on some classics. If you want the Chef's pick, go for the BBQ Crispy Tofu Bowl (419/651 calories - crispy lemongrass tofu, chipotle BBQ sauce, and brown rice topped with avocado, black beans, cabbage, corn, jicama, snow peas, and tomatoes). Next up on their menu are the Flatbread Melts ($7.75) of which their most popular is the Greek Chicken Melt. 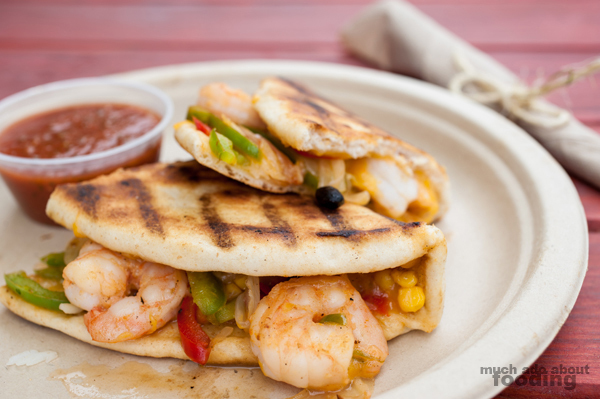 We went with the Chef's pick though of Chipotle Barbecue Shrimp Melt (+$1, 734 calories - grilled lemongrass shrimp topped with Monterey Jack & Cheddar cheeses, onion, corn, and peppers in a clay-oven flatbread with chipotle barbeque sauce), a flavorful and gooey entree with the familiar spicy tang of barbecue highlighted with an extra chipotle kick. The shrimp was plentiful and cooked to the perfect texture, and we found the flatbread crisped up well on the outside with enough bready "fluff" on the inside. Looks like they know what they're doing with their melts. The Wraps ($6.75) side of the menu was next, and we got to check out a menu item and a variation that a person could do through the "Choose Your Own" option. For this one, the Greek Steak Wrap is the most popular so far but again we chose the Chef's pick - Thai Tofu Wrap (502 calories - crispy tofu, carrot, cabbage, cilantro, onion, cucumber, edamame, peppers, and mixed greens with Thai peanut sauce). Chef Kyle also noted that this one was probably the best use of the Thai peanut sauce in an entree. 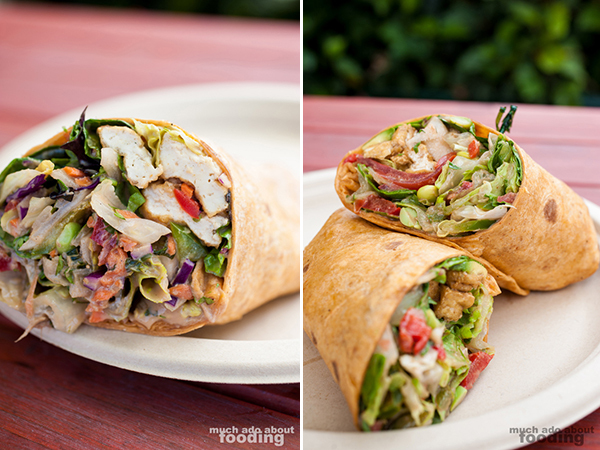 Bright and crunchy, this wrap packed a lot of fresh vegetables and tangy Asian flavors. It was fantastic and an easy example of tofu done well to appeal to both tofu lovers and on-the-fencers (hopefully haters as well?). We also had their Crispy Tofu Salad (crispy lemongrass tofu, edamame, peppers, cucumber, avocado, jicama, tomato, and mixed greens with balsamic vinaigrette) in a wrap which was even crunchier than the previous due to the chunks of jicama included. I'd opt for the other one though because we found the jicama cubes and edamame popping out of the wrap one too many times for clean eating. Speaking of salads, that's next on their menu! 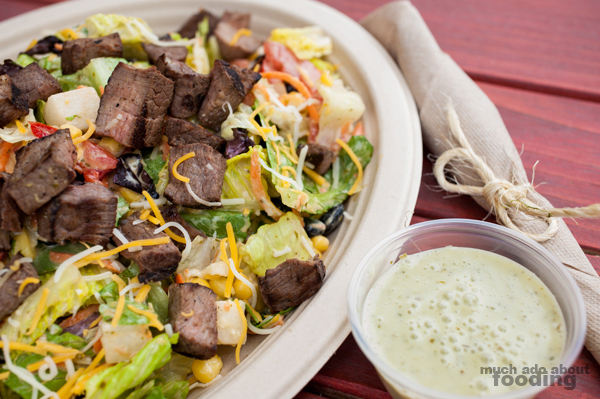 Salads ($7.25) are certainly much more familiar so the most popular so far has been their Southwest Steak Salad (641 calories - marinated grilled steak, black beans, carrot, corn, jicama, peppers, tomato, Cheddar Jack cheese, and cilantro on mixed greens with agave lime vinaigrette) which we dug into with aplomb. Everything had been cut up to easy salad-eating size including the juicy pieces of steak, and the greens were aplenty. I absolutely adored the agave lime vinaigrette that had a needed creaminess to it while still maintaining a sweet and sour component. If all the salads find themselves with this type of freshness, I need more. What gets most of the rave on Yelp is their selection of Stews ($7.75 with +$.50 for flatbread). We tried out both of them for good measure, and it was one of our favorites. Perhaps it's the comfort food aspect of a stew that made us want more. It's savory, hearty, and heavily seasoned. 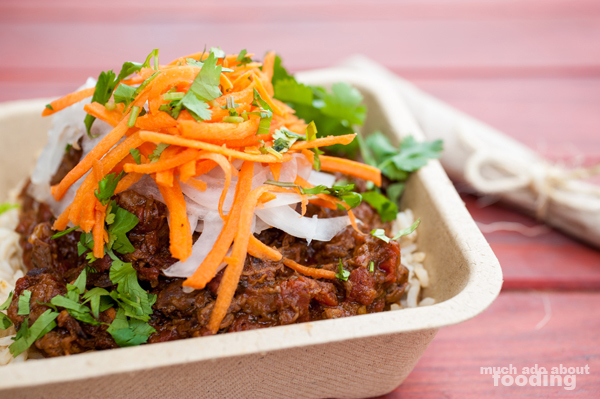 The Red (564/944 calories - achiote beef and carrot stew with stewed tomatoes and South American spices) was actually inspired by Chef Kyle's love for Vietnamese food (incited by his move to Orange County no doubt) and was similar to a common Vietnamese dish. Served over rice, this stew with peel-apart meat and much heartiness from the tomatoes was finished quickly. It would have come off too salty in my opinion without the rice but who eats this type of stew all by itself anyhow? 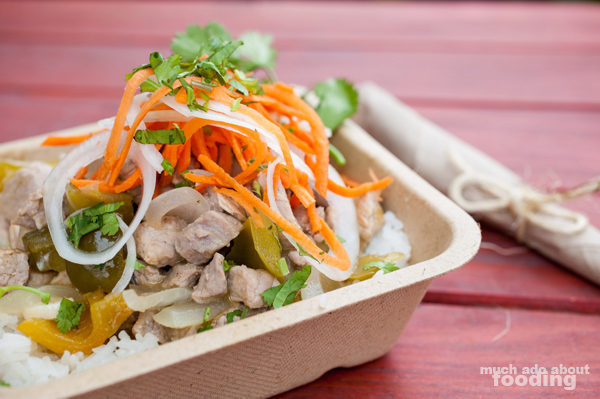 The Green (624/1004 calories - pork stewed in an authentic green chili sauce with bell peppers and regional vegetables) is the only item to break the 1,000 calorie barrier but just by a hair. This one reminded me of a traditional Filipino dish and was yet another hearty dish. The pork was soft and the sauce not directly spicy but a slow, subtle burn. I can understand the hype now. 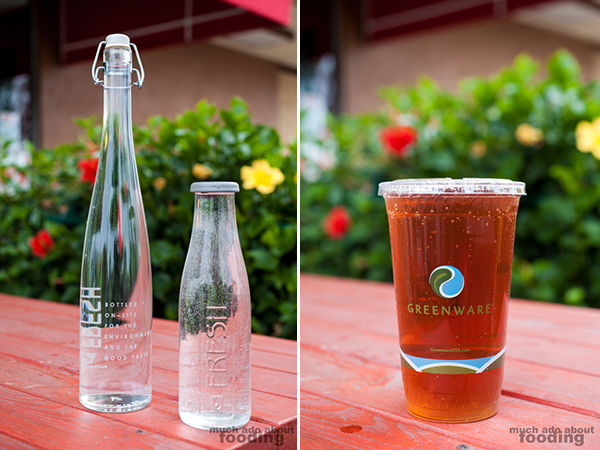 With the food geared towards being local and organic, it was no surprise that Green Tomato Grill also supports local businesses and the community. Chef Kyle shared with us that their Desserts are actually all from the local Fountain Valley Sensitive Sweets, a gluten-free and nut-free bakery. Their dessert options are rotating depending on the delivery from the bakery so we tasted a few and plan on visiting the place directly sometime later. 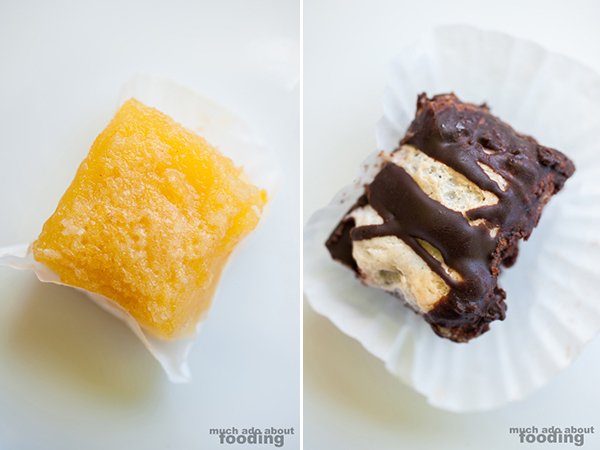 I didn't care whether they were gluten-free or not; they were just plain good as desserts themselves, especially the S'mores brownie. 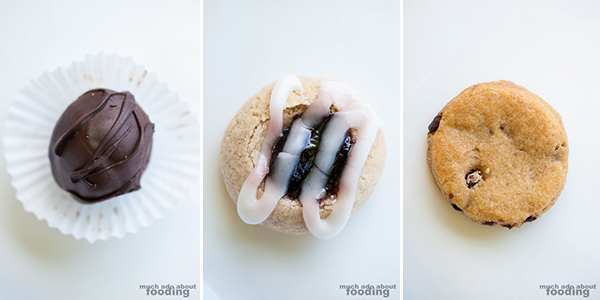 The inclusion of Sensitive Sweets goes hand-in-hand with Green Tomato Grill's desire to accommodate people with dietary needs. 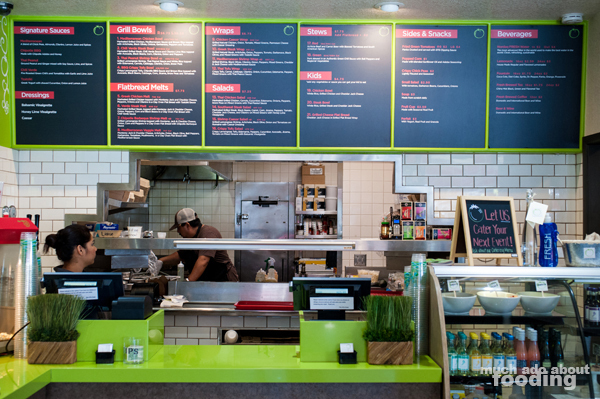 All of their housemade sauces (save for the tzatziki) are gluten-free and vegan and available for sampling at any time. They have a Mediterranean (blend of chickpeas, almonds, cilantro, and lemon juice), Chipotle BBQ (chipotle adobo and agave), Thai Peanut (ground peanut and ginger mixed with soy sauce and lime - no fish sauce), Chili Verde (fire roasted green chilis, tomatillos, and garlic), and Tzatziki (Greek yogurt with shaved cucumber, onion, and lemon juice). They also have dressings of Balsamic Vinaigrette, Agave Lime Vinaigrette, and Caesar. How do you make the creamy ones creamy while remaining vegan? Tofu! How creative is that? If you're interested in dropping by, please do. They have wifi for you to use, a friendly and knowledgeable staff, a breakfast menu now, plenty of parking, and delicious food. 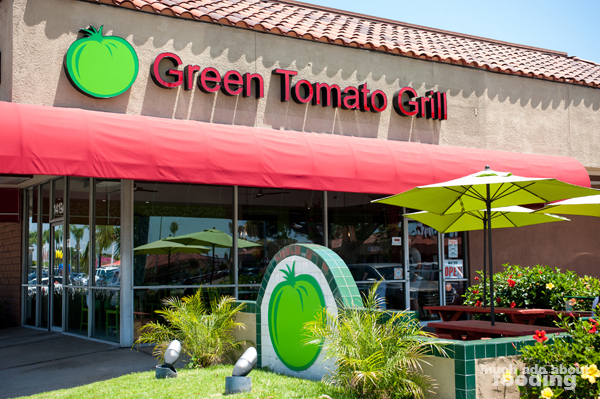 You can also get Green Tomato Grill to cater or host a fundraiser night. Soon enough, there will be a monthly farmers' market on Sundays in the main parking lot area of the plaza as well. Visit them at 1419 N Tustin St in Orange! To help out with that, I've got a giveaway below for two winners who can win two entrees each. Enter and if you win, take a friend to nom with you. My thanks to Chef Kyle Markt and his staff for spending time with us and teaching us about what great things Green Tomato Grill has going on. The giveaway will run until 7/14/13 at 11:59pm PST. Winners will be contacted upon winning and have 48 hours to respond before another winner is drawn. Thai Peanut b/c I'm nutty. Tzatziki, cause I'm cool as a cucumber. Can you believe I've never had fried green tomatoes before? HOW UN SOUTHERN OF ME coming from the most southern state too..
Chili verde -- this time of year, I'm feeling fire-roasted 24/7! Oh no! Hope you don't get burned! Tzatziki for me. I love fresh! Though my boyfriend would probably choose Thai Peanut. Who's to say I can't call dibs on half of his?! It's hard trying a new place because you wamt to try it all on the first day!